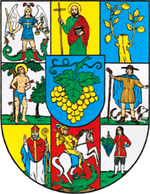 Döbling is the 19th district and on a total area of 24.9 km² live 72,107 inhabitants. The district is located at the north-west border of the district and is known as a noble neighbourhood as it is one of the most expensive residential areas of Vienna. There include a few regions, formerly independent, however, over the years one by one assigned to the 19th district: Grinzing, Sievering, Neustift am Walde, Kaasgraben. The 19th district impresses also with its architectural variety: there are beautiful old Villas and single-family houses as well as residential buildings of all kinds which were built by the Municipality of Vienna. The most famous building built by the Municipality of Vienna is the Karl-Marx-Hof. It is a 1,100 meters long complex with 1,400 apartments. Regarding the transport system, the citizens of Döbling can hardly complain. Apart from busses, tramways and the subway line U4, there is also the railway station for regional traffic Heiligenstadt. In the 19th district there are many luxury properties located, not least because there is the international American School in Döbling. Therefore, the purchase price for living space in Döbling is around € 6,098/m² and the rental price is approx. € 15.78/m². Furthermore, the 19th district is with 48% of green areas – including the Vienna Woods, park areas and of course the world-famous Vienna Reeds a very green and extremely quiet district. The average living space in Döbling is around 82m² and the living space per head is about 41m². In total, there are 7,720 residential buildings in the 9th district, 1,672 were built before 1919 and 1,101 after the year 1991. Döbling is also due to its medical facilities well-known. Therefore, the medical tourism is omnipresent in the 19th district. Furthermore, Döbling boasts various tourist attractions: the mountain Kahlenberg which offers a picturesque view over Vienna, numerous Viennese taverns, which offer customers excellent Austrian wine and Austrian culinary specialties with familiar atmosphere. Several stadiums as the one from the old football club First Vienna FC, founded in 1894, swimming baths and various sports fields offer the inhabitants of Döbling numerous possibilities for sport and outdoor activities.